Many have cruised the South Pacific extensively, while others have circumnavigated. 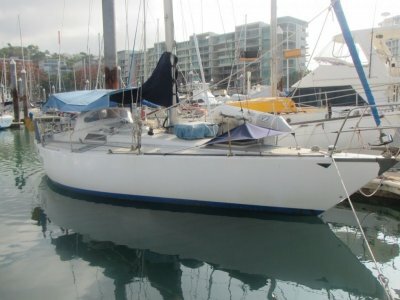 Right from the get go, when Sea Spray magazine in July 1971 took the first production boat for a sail they were impressed by both the spacious interior, berthing up to eight, and its on-the-water performance; noting it was fast, responsive, incredibly close-winded and with good acceleration. 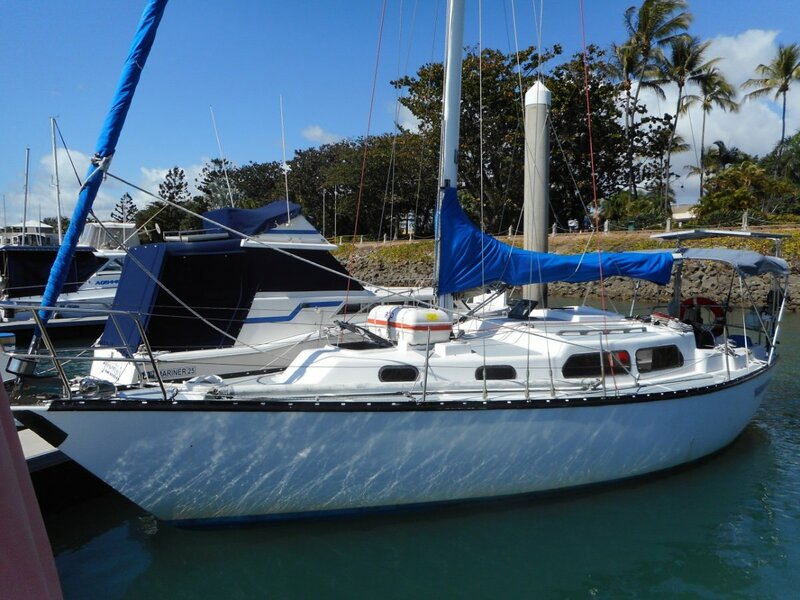 Designed by Bob Salthouse in 1969, the prototype Cavalier 32 made its debut at the 1970 Auckland Boat Show. The concept was for a hull with high racing potential; a boat that would be satisfying to race inshore as well as offshore, yet have family-size cruising accommodation. It immediately proved popular with 14 boats sold by the time the first boat was launched in Jul 1971. The Cavalier 32 became the first boat offered by a relatively new partnership between John Salthouse and respected boat builder Peter K. Smith. 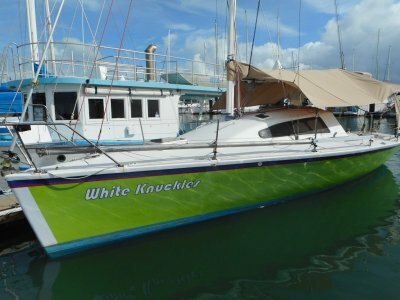 The venture was known as Cavalier Yachts, which incidentally, at its peak in the 1970s became the largest production boatbuilder in Oceania. Shortly after its introduction the boat's rig was revised with a shorter mast and boom to rate under the half ton racing rule. As a half tonner, the Cav32s were formidable competition that the boat stacked up many victories in the mid-70s. 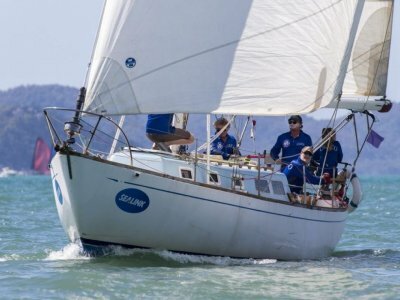 The racing tradition of the Cav32 is alive and well today, each year a team of RNZYS skippers compete with the Royal Sydney Yacht Squadron aboard Cav 32s both in Auckland, NZ and Sydney, Australia. In the 30 year history there has never been a protest; in grand Kiwi-Aussie spirit, all altercations have been settled in the bar. The boat went on to find its niche as a favorite among the cruising community. In total 99 boats were built in New Zealand before the infamous 20% "Muldoon boat tax" decimated the NZ boatbuilding industry. The molds were exported to Australia and Japan where a similar number were built. The Australian boats sported a redesigned rig that was 1.5m taller as well as some altered layouts. "Bullet proof"... Andrew Fagan recounts the maiden delivery voyage of Tingara in 1975, skippered by none other than builder Peter Smith himself. The boat was caught in extreme conditions passing Castlepoint; wind speeds were clocked at a sustained 100knots with gusts of 120knots. A nearby 55ft fishing boat floundered with the loss of 2 lives while Tingara, running on bare poles, was broached and rolled multiple times by breaking waves. Remarkably the rig stayed put, and the crew did not send a mayday (the radio quit), and after riding out the rough stuff, the boat made its way into Wellington harbor a little wet inside and a some staved in washboards. By modern lightweight racer/cruiser standards the Cavalier 32 is considered a substantial all rounder with excellence in heavy conditions and downwind performance. Helped by it's 50% ballast ratio, expect to hold up full canvas well after other boats have to reef. When Sea Spray magazine tested the boat during its debut, they described the boat being particularly stiff, "when a gust hits, the boat accelerates forward and does not lay on her ear and fight to round into the wind". They noted the boat being fast off the wind without the tendency to broach and summed it up by saying, "At all angles of sailing the boat is superb. When ghosting she carries her way and makes miles; in the fresh she is truly exhilarating"
The boat is well balanced and easy to sail and single-hand. Expect finger light steering at all times. The Cavalier 32 has relatively modern lines for a boat conceived in the early 1970s There is a moderately racked bow tapering out to a relatively narrow beam and a powerfully shaped aft quarter, reminiscent of successful Sparkman and Stephen cruiser/racers like the S&S34. The overhangs are nicely balanced and the sheerline attractive. Under the waterline is a fin keel drawing 5? 6? and a skeg hung rudder which is controlled optionally by tiller or wheel depending on the boat. There are some shoal draft examples on the market that draw 5? 3? and 5? 4?. The cockpit has space for three and is adequately protected by substantial coamings and a coachroof that is just the right height. Side decks offer easy passage. Five crew can quite happily get about the decks in sailing mode. Up above is a masthead rig with a small high aspect ratio main and a large genoa. A handful of the earliest NZ boats had taller rigs, as did all of the Australian built boats. Inside, the cabin feels spacious for a 32 footer of its era with 6? 1? of headroom. There are twin sea-going quarter berths in the space below either side of the cockpit. The galley is small and functional on port side of the boat. 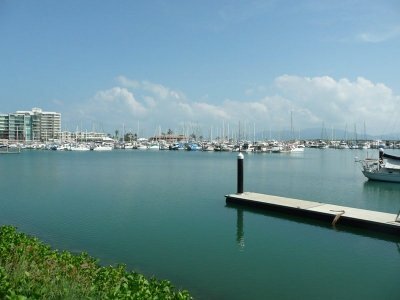 Refrigeration is under the port quarter berth, which can be inconvenient to access at times. Across from the galley on starboard side is a decently sized nav station. Further forward is the saloon with settee births on either side of the keel-stepped mast which intrudes into the cabin area, not entirely the most ideal setup for liveaboard space. The saloon table on most boats can be put away by sliding it up the mast to the cabin top. On the other side of the forward saloon bulkhead is the head which shares space with the v-berth. On some models the head is built on the saloon side of the bulkhead subtracting from saloon space but allowing for full twin berths in the V.
Various accommodation layouts were offered with up to eight berths. The interior is finished in white, mahogany trim and mahogany veneer giving an overall feel that is light and spacious. The boat was one of the early pioneers of cored fiberglass construction. The hull is built incredibly strong with hand-laid GRP with end grain balsa coring. The layup from the exterior moving inwards starts with the gel coat which is reinforced by 1oz matt, then followed by 10oz cloth and two layers of 2oz matt. The balsa coring is 19mm thick in the bilge and 13mm thick above the waterline. Then comes 2oz matt and 24oz woven rove which forms a strong impact resistant layer. All through deck fittings are backed by wood and glassed over. The hull-deck join is epoxy glued, then pop riveted with Monel rivets every 6 inches and stainless steel bolts every 12 inches. The join is glassed over forming a gusset equal to the hull thickness. Good functional gally with fridge freezer front load. Very good design. 240v shore, solar, Victron battery monitor.